You’ve saved. Scrimped. Worked hard. Missed overseas trips, delicious and expensive breakfasts and music festivals … all in the pursuit of saving a deposit for your first home. After all that you’ve managed to save $20,000, $30,000 or even $50,000 – a huge effort! But, unfortunately, you’re still barely half way to where you want to be. Despite house prices gains in major cities beginning to stall, the damage is done – a first home buyer is likely looking at laying out around $500,000 or more. If the full 20 per cent deposit is still the goal, that means coming up with $100,000. How, then, can a hopeful first home buyer put their existing savings to work for them while they continue to save? The methods outlined below focus on investing for income, rather than growth, so would theoretically boost an ongoing savings plan, rather than replace the task altogether. It’s always best to speak with a financial adviser or planner before embarking on an investment strategy, and remember that, in all forms of investing, past performance is not a good indicator of the future. 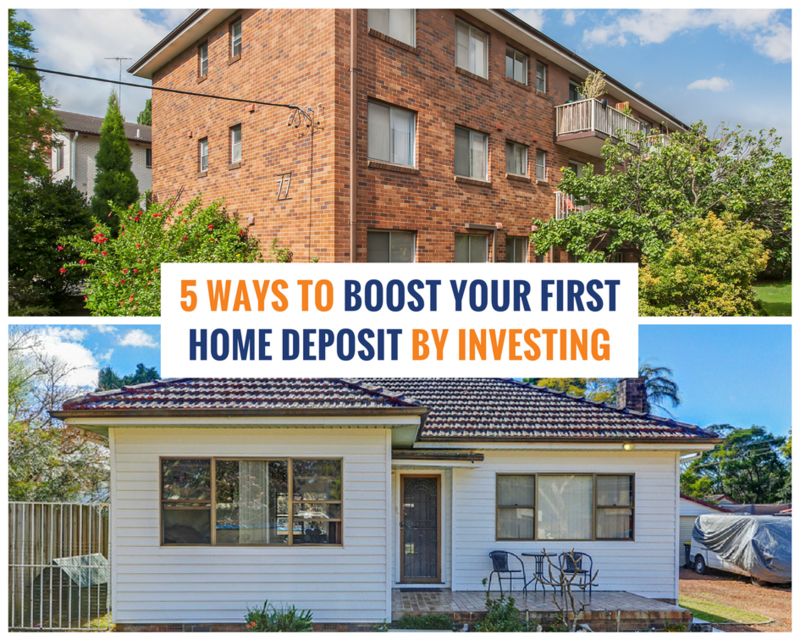 That said, here are five ways young people could invest for income to put toward a first home deposit. This is extremely popular territory for young savers. As far as risk goes, there’s pretty much zero. The bank will tell you in advance what your return will be, and you know exactly when you’ll be able to re-evaluate your investment. The cost of that peace of mind, however, is large. Thanks to a global plunge in official interest rates, one-year term deposit rates in Australia have dropped to a record low of 2.25 per cent on average. It’s an easy-to-understand and safe way to store your savings but, unless official interest rates start rising fast, will provide almost no income. After a year, your hard-earned $30,000 will only bring in an extra $675. If you roll it over for five years, you’ll have a total of $33,530. “The yields on these investments will move over time and, since the aftermath of the Global Financial Crisis (GFC), the trend has been down,” according to AMP Capital chief economist and head of investment strategy Shane Oliver. “There are lots of alternatives to bank deposits for income,” Dr Oliver said. Shares are inherently volatile. A 10 per cent drop in the value of an equity or sector is not that uncommon, according to market experts. That’s why a couple of things are widely agreed on – diversity is a good idea, short-term or leveraged trading comes with heightened risk, and emotions are best left out of it. That said, the ASX 200 is heading for 6500 points by the end of next year, according to one market strategist – Credit Suisse’s Hasan Tevfik – which marks an almost 10 per cent gain from current levels and 15 per cent total return. “We don’t think bull market is over,” Mr Tevfik told Domain. He’s talking about the whole index of 200 companies, which can offer a false sense of optimism for retail investors planning on picking a handful of stocks and hoping for the best. That’s why equities ring alarm bells for so many – individual stocks can be heartbreakers, and, while volatility has dropped in recent years, a fall is often lurking in the shadows. But, with a total yield of around 6 per cent (including franking credits) $30,000 would become $40,146 over five years. This is where everybody’s eyes glaze over. Franking credits, or “dividend imputation”, is tricking you into ignoring it by having the world’s most boring name. It’s actually a brilliant feature of Australian stocks and can add to your income. Click here to find out more about franking credits, but, in a nutshell, Australian companies pass them onto the shareholders, who can then use them to reduce their tax burden. Paying less tax (or, if you’re on a low marginal tax rate, even scoring a refund) is as good as earning more. Rather than picking a handful of shares yourself and crossing your fingers, ETFs allow investors to track the performance of an entire index or asset class at once. An ETF manager packages tradeable funds, which follow an index or commodity, or bundle stocks aimed at following a certain sector, like healthcare or even cyber security. And, as with all investing, the focus is usually slanted either towards growth or income. “There’s always going to be a trade-off, you can’t have it both ways,” BetaShares spokesperson, Ilan Israelstam, told Domain. But some of the ETFs group high-yield stocks together at the expense of overall capital growth. So, unlike a bank term deposit, you’ll receive more income during the investment but the overall value of it might not track any higher – in fact, it might drop. “An example of that would be our Equity Yield Maximizer Fund – that owns the top 20 ASX stocks and uses an options strategy, basically, to give you a higher income,” Mr Israelstam said. Younger income-hungry investor might want think about bringing in some growth to their portfolio, according to the fund manager. If a 9 per cent return is maintained for five years, and dividends are reinvested, then $30,000 could become $46,158. For those hell-bent on using property as an investment, but lack the capital – meet fractional property investing. Funds like BrickX and DomaCom offer the opportunity to gain diversified exposure to the housing market while lowering the bar for entry. DomaCom is a managed investment scheme which uses a crowdfunding campaign process to pool property investors together. The investors then contribute as much as they want towards the purchase of a property and receive “shares” in return. Investors can buy and sell their shares to other investors. BrickX, similarly, buys a property in advance and then offers 10,000 shares, or “bricks”, in that property, which are sold individually to investors. Both offer distribution to investors from rental income in line with their number of shares. The proposed first home Super Scheme offers the chance to temporarily tack your savings onto your super and be taxed at a lower rate than usual. Announced in the May budget but still to be fully legislated, individuals can make voluntary contributions of up to $15,000 per year and $30,000 in total, to their super account, according to the federal government plan. These contributions and earnings would then be taxed at 15 per cent and can be withdrawn only for a first-house deposit. Withdrawals will be taxed at marginal tax rates minus a 30 per cent offset. The scheme was meant to come into effect on July 1 of this year but has been delayed. Finally, why have we been talking about investing for income rather than growth? Because for many, buying a house remains a short-to-medium-term goal. Plenty of analysts and asset managers will tell young investors to take advantage of their age and go for growth, which means taking riskier investment options. They can “weather the storms” better than older investors who’ll need their money sooner for retirement. But if the goal remains buying a house, then young investors don’t have all that much time either. It could be that all they want is to do better than the 2.25 per cent bank rate for a few years while they continue their savings plan. That’s why first home buyers should be looking around for options where their risk remains relatively low but their return is better than they would get with a bank.